Pocket case, neat's leather Spazzolato, black, 3 pcs. We are engaged in offering Folding Manicure Set. Beautymax manicure set in original box and never used. 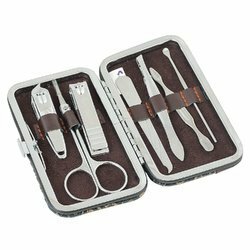 It is a comprehensive set of nail tools which are in a brown/beige/white checked case. Buy online Women Essentials (Leather Manicure Set) at our store. We deal all types of Women Essentials at very best price. - includes 6 heavy duty, Stainless steel grooming tools. A lovable twosome to take care of your nails in a super convenient travel-size. Includes a nail clipper and nail shaper to cut and smooth so you can carry your own little manicure in your purse. The antioxidant rich blueberry gives an extra collagen boost to your skin giving results of Toning, Tightening and rejuvenating.